NEW YORK--(BUSINESS WIRE)-- The New York Times Company today announced that it has acquired The Wirecutter and The Sweethome, product-recommendation services that serve as a guide to technology gear, home products and other consumer services. The acquisition was an all-cash transaction that closed on October 24, 2016. Founded in 2011 by technology journalist Brian Lam, who worked as an editor at both Gizmodo, and Wired, The Wirecutter and The Sweethome, its sister site, are lists of the best gadgets, gear and other products for people who quickly want to know what to get. The sites are built on the strong editorial backbone of journalists making research-driven, powerful product recommendations. The sites generate revenue primarily through affiliates—that is, money earned by offering direct links to merchants in exchange for a share of any ultimate sale. These merchants include both major online retailers such as Amazon, as well as niche and vertical-specific shops. “We’re very excited about this acquisition on two fronts. It’s an impressively run business with a very attractive revenue model and its success is built on the foundation of great, rigorously reported service journalism,” said Mark Thompson, president and CEO of The New York Times Company. “The New York Times is the definitive source for news, information and entertainment and now we’re working on becoming an authoritative destination for service journalism, with verticals like Cooking, Watching and Well. The practical approach that The Wirecutter and The Sweethome take to product recommendations embodies the same standards and values that are the pillars of our own newsroom. Their service-focused guides align with our commitment to creating products that are an indispensable part of our readers’s lives,” Thompson added. Following the acquisition, Mr. Lam will stay on in an advisory role, while Jacqui Cheng, editor-in-chief, and Christopher Mascari, product director, will remain in those roles. Ben French, vice president of NYT Beta, will serve as interim general manager and will work to integrate The Wirecutter and The Sweethome into The Times Company. Some of the statements included in this press release, including those with respect to the integration of this business and strategic goals, are forward-looking statements that involve risks and uncertainties, and actual results could differ materially from those predicted by such forward-looking statements. These risks and uncertainties include risks detailed from time to time in The New York Times Company’s publicly filed documents, including its Annual Report on Form 10-K for the year ended December 27, 2015. The New York Times Company undertakes no obligation to publicly update any forward-looking statement, whether as a result of new information, future events or otherwise. The New York Times Company is a global media organization dedicated to enhancing society by creating, collecting and distributing high-quality news and information. 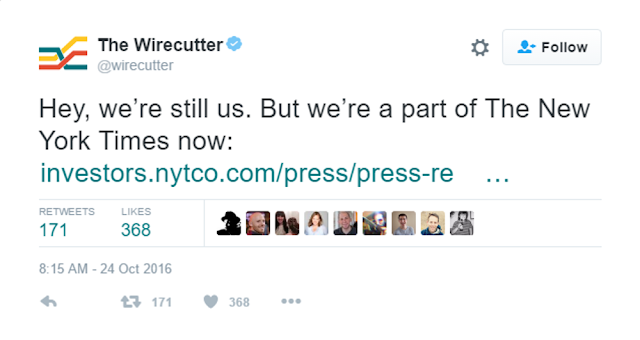 The Company includes The New York Times, NYTimes.com, and related properties. It is known globally for excellence in its journalism, and innovation in its print and digital storytelling and its business model. Follow news about the company at @NYTimesComm. Founded five years ago by journalists fed up with the time and energy it takes to shop, The Wirecutter and its sister site The Sweethome developed a simpler approach to giving buying advice: just tell people exactly what to get in one single guide. The company’s purpose: to help people find great things, quickly and easily. Through rigorous testing, research, and reporting, they create straightforward recommendations that save readers from unnecessary stress, time, and effort.